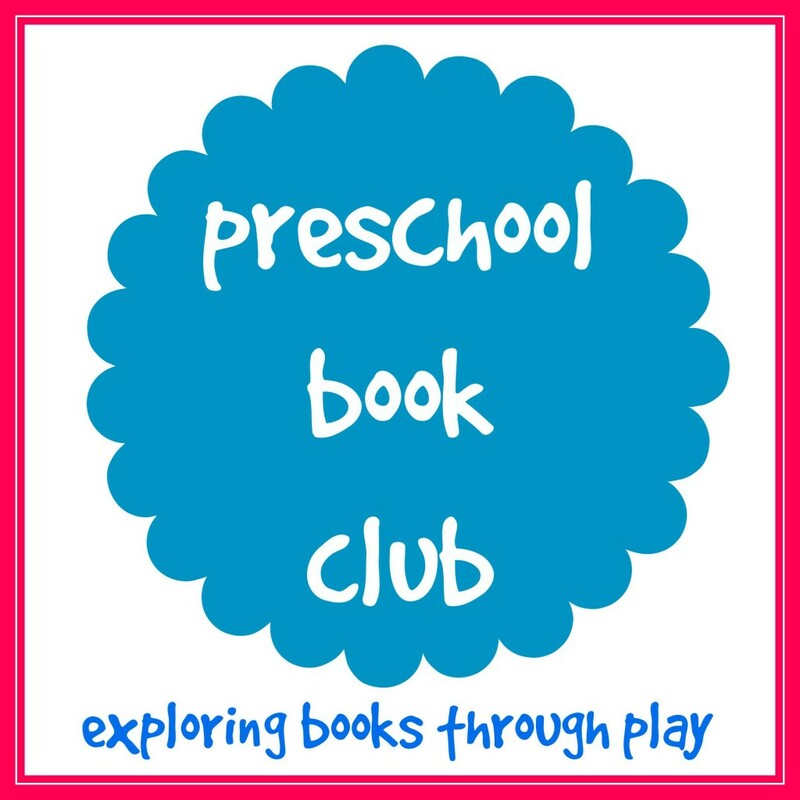 It is time for this week’s Preschool Book Club. 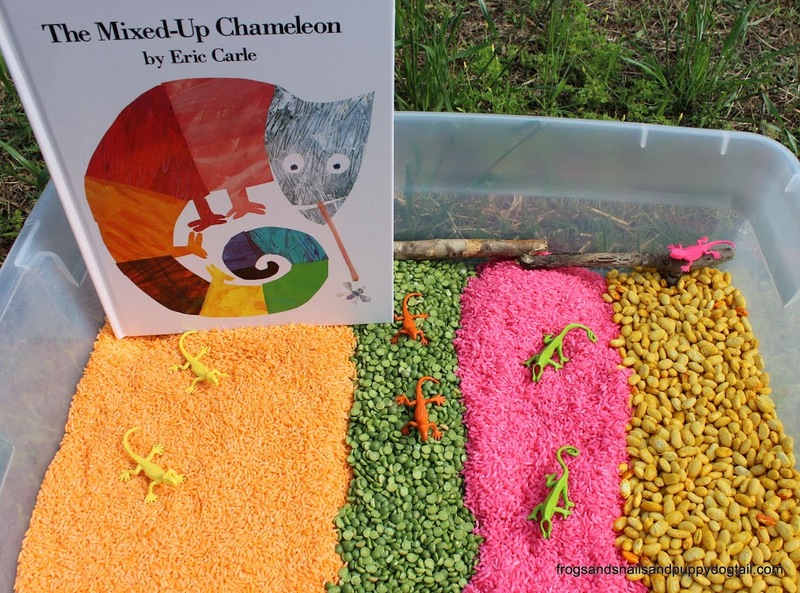 This week we are exploring one of our favorite books, The Mixed Up Chameleon. 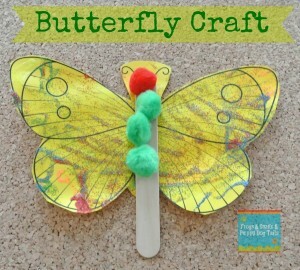 My kids love Eric Carle Books (see our favorites by clicking here). I think this my be my favorite activity yet for the series. 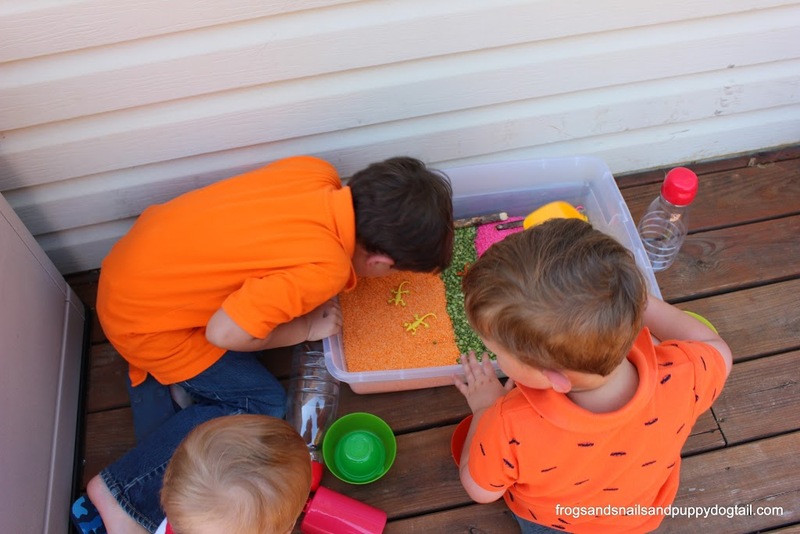 The Mixed Up Chameleon Sensory Bin is easy to make and loads of fun for playtime. After putting a lot of thought into what type of bin I would set up, rice and beans won out. I wanted more than one sensory bin filler. 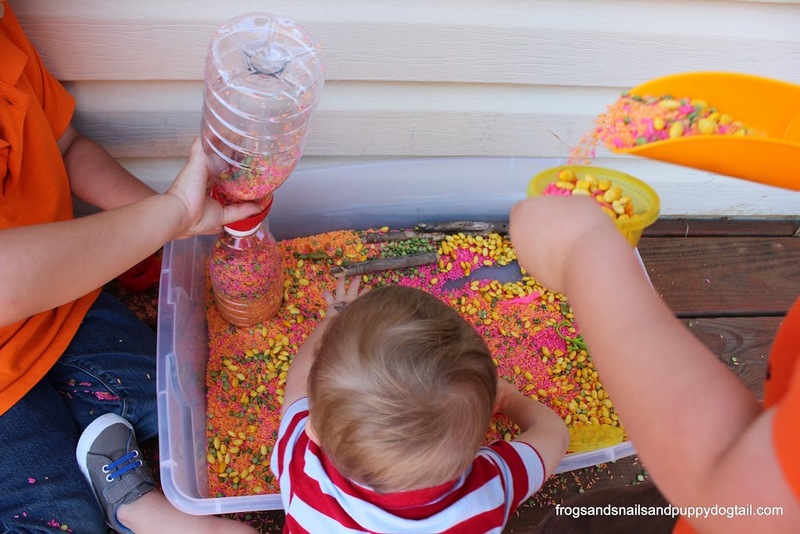 With 2 fillers it would be a “mixed up” sensory bin. 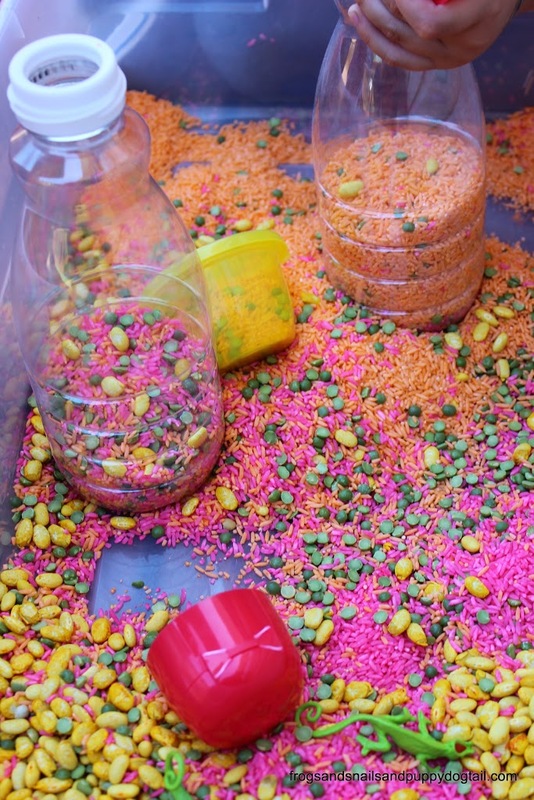 This sensory bin was set up for the purpose of having FUN. This is not a typical habitat for a chameleon and the toys inside are probably lizards and not chameleons. 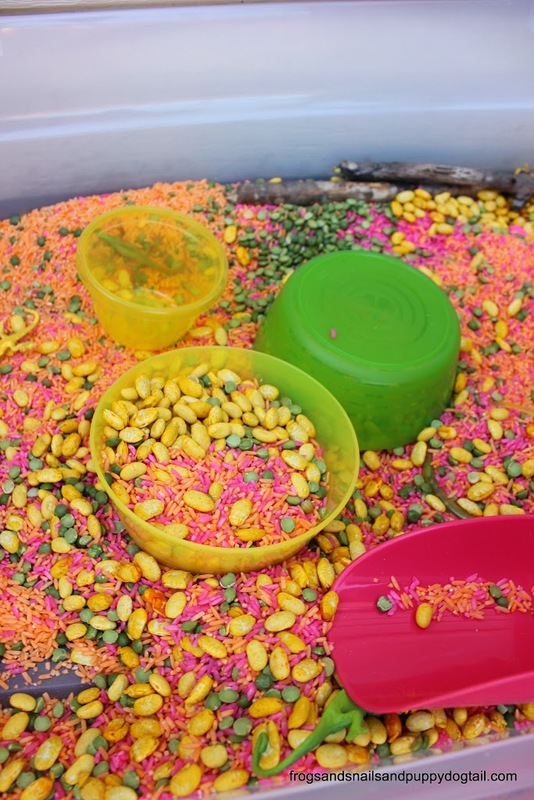 But for the sake of play, it was the best Mixed Up Chameleon Sensory Bin I could set up for my kids. I Put the colored and scented rice and beans in the under the bed storage bin we use for playtime. I put them side by side. I then added our plastic toys. One of the “chameleons” was pink and 2 were green. The other 4 I spray painted to give them fun colors. I added a few containers, scoops, and bowls. 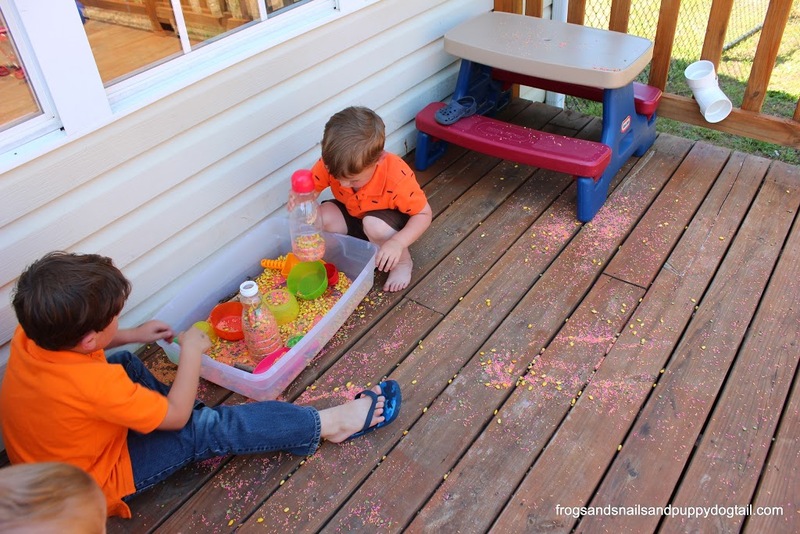 We took our sensory bin outside for playtime. It SMELLED AMAZING! Cherry and orange rice with lemon beans. 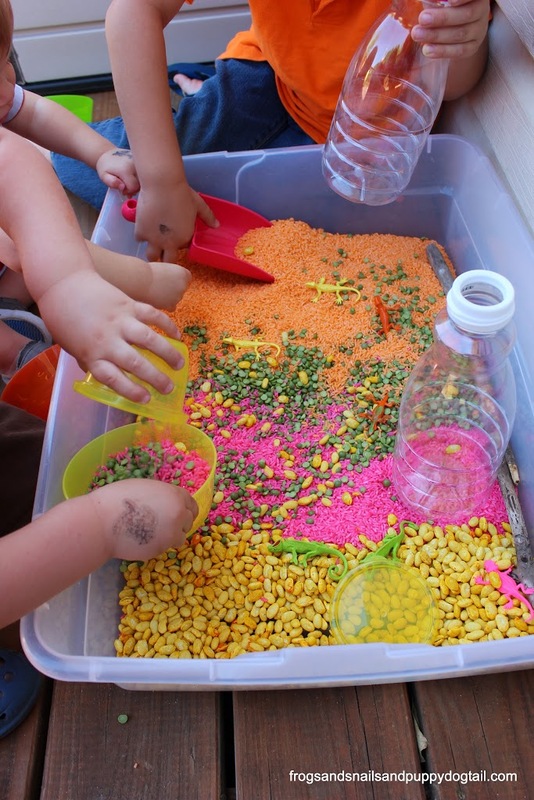 This sensory bin was great for my multi aged kids (1-5yr). All of them got to enjoy playing in it. 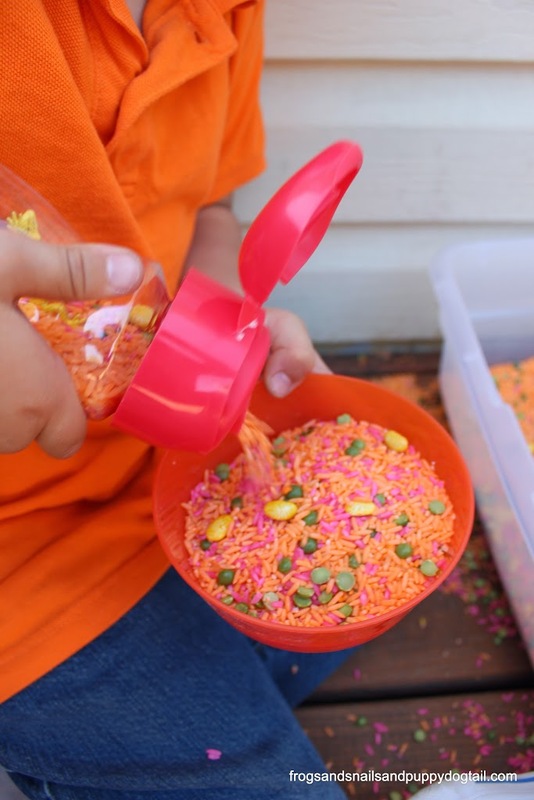 The scooping and pouring (gross motor skills) seemed to be the kids favorite. The kids got to explore sight, touch, and smell in this bin. 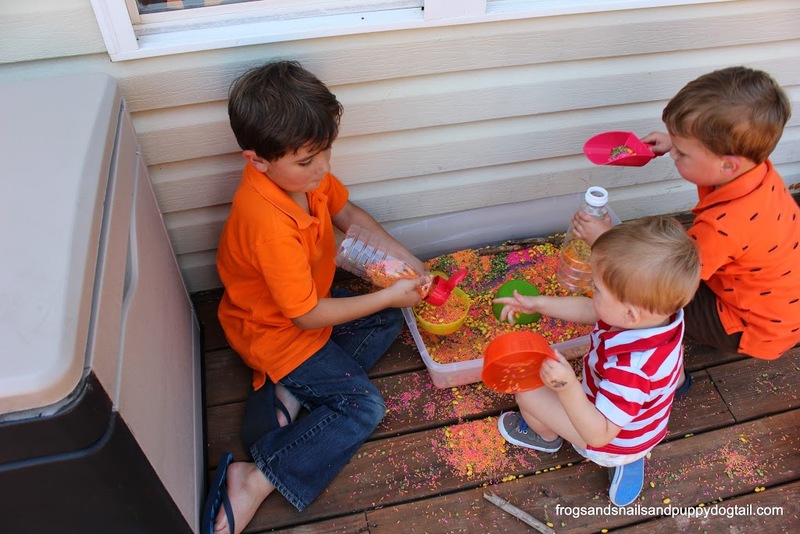 Also a great way to enjoy pretend play. It was an open ended activity for the kids. I just love how the colors turned out! Fun and bright. I did add a few sticks to the sensory bin but to my surprise they did not get played with. Since sticks are a must on walks and zoo trips… I thought for sure they would play with them. This was a bit messy. We did keep a little of the rice and beans for playtime again. The rest was swept up. Next time I might lay a plastic table clothe down. I hope it will hold the mess. Then I can just pick it up and trash it. 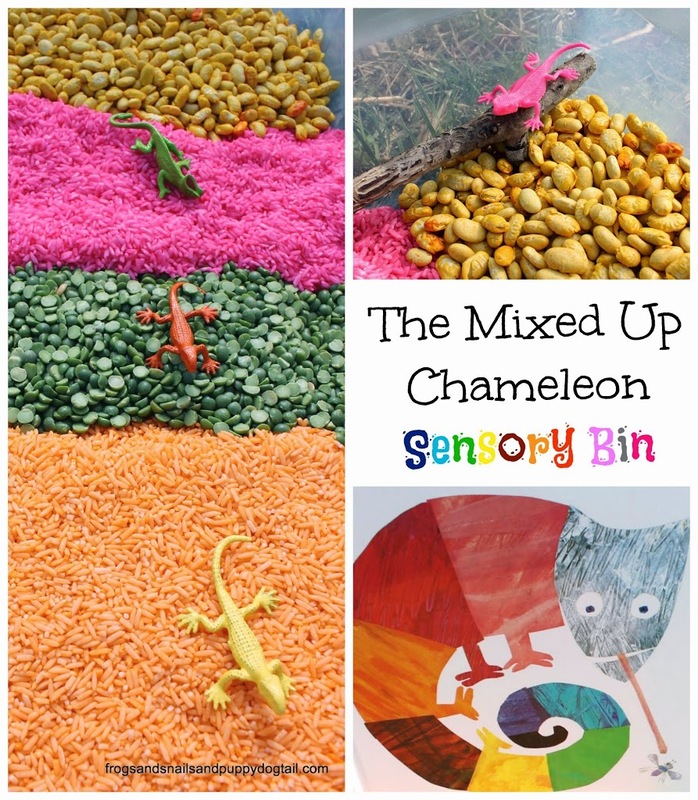 We read a great book and then went out to explore our Mixed Up Chameleon Sensory Bin. A fun way to spend the afternoon. 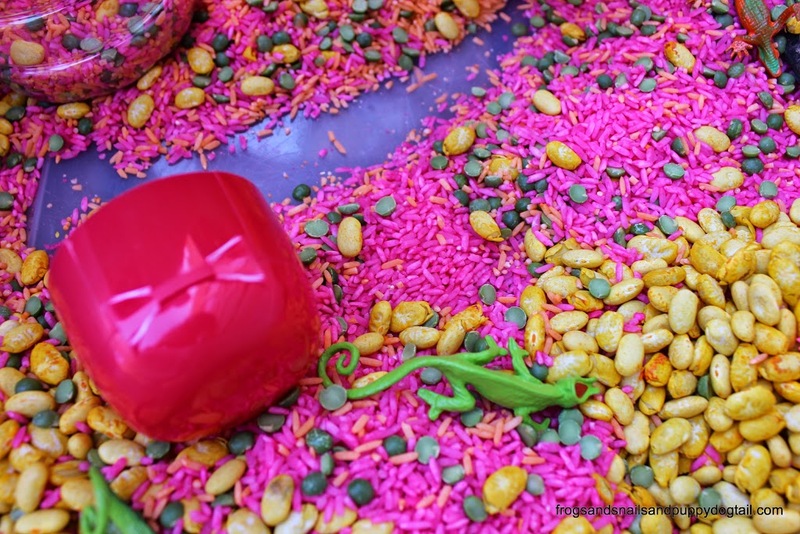 Follow the directions here and substitute Cherry extract for the apple scent and pink food coloring for the red. 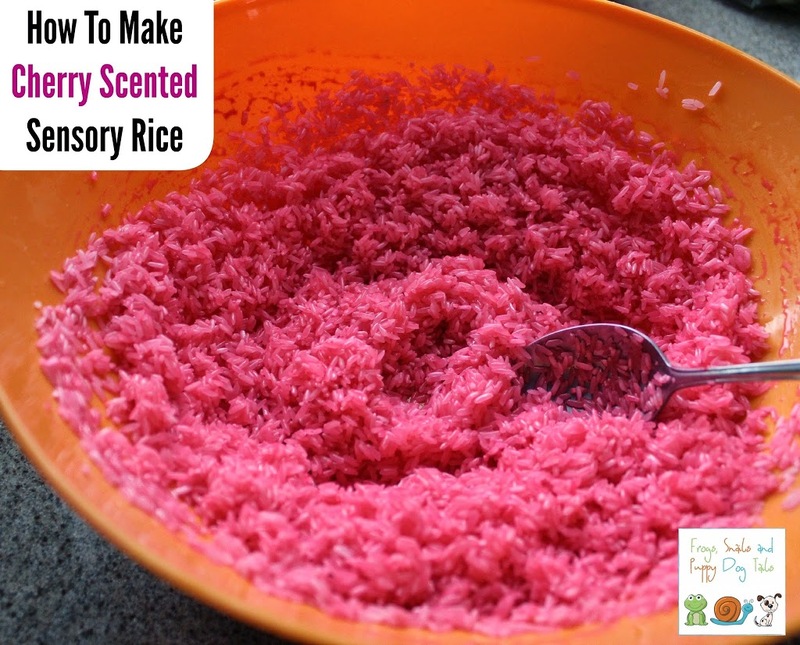 Then you end up with awesome Cherry scented rice for play. Follow the above link and substitute Young Living Orange Essential Oil – 15 ml for the apple. Then add orange food coloring and not red. 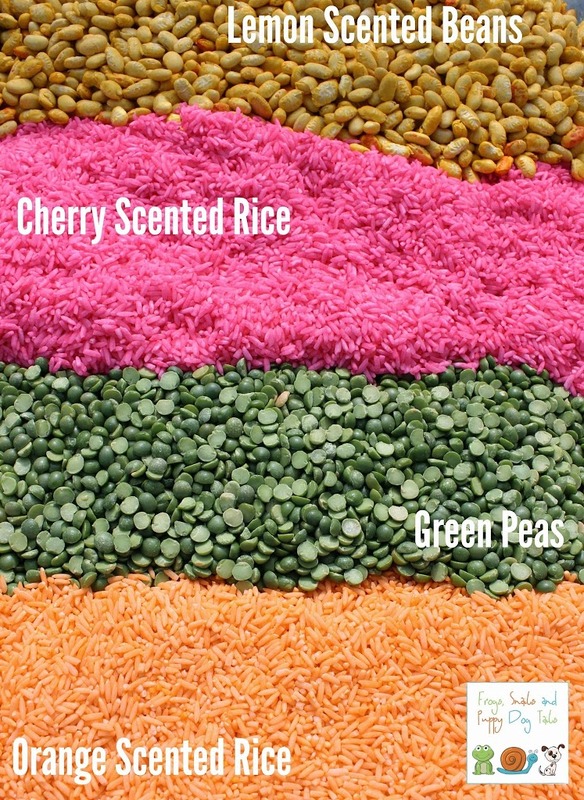 You will end up with bright colored rice with a wonderful smell. I followed the directions here Coloring Lima Beans for Learning and Crafts by Praying for Parker. Then I added Young Living Essential Oil Lemon 15 ML for scent. The green peas, well, they were already green so I did not do anything to them. 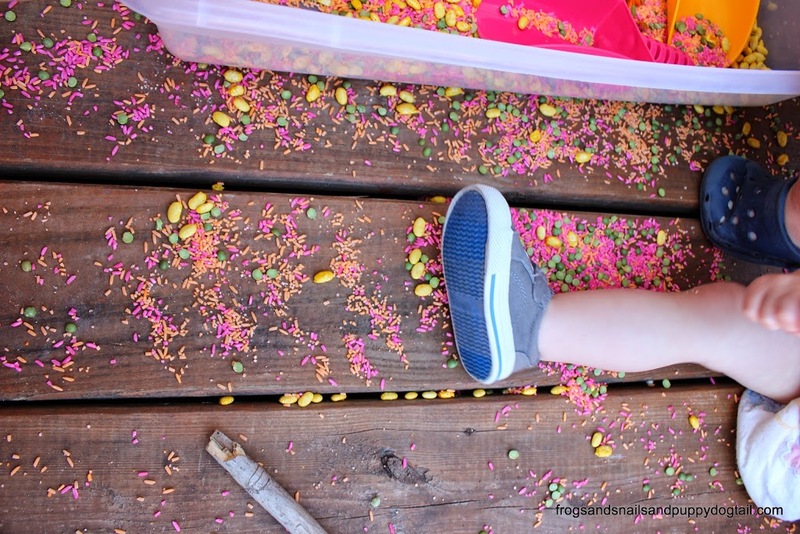 ~You can find more colored bean fun here How To Color Beans for Play by Fun At Home With Kids. ~Another idea for colored beans is decorations here Vase Filler by Baking Therapy. 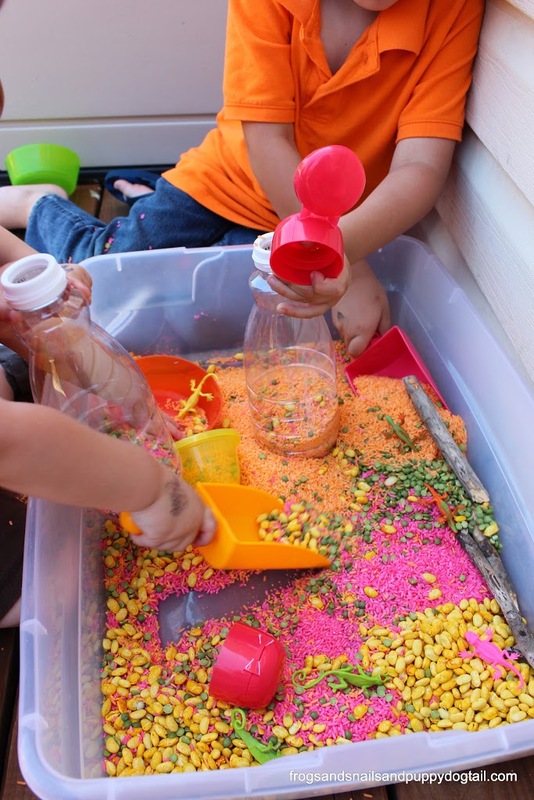 Sensory bins are always a big hit at our house! I love how this one looks- so colorful and fun!